This year I wanted to create my own gift tags for our Christmas presents. In the past what I’ve done is decorated the package with a sharpie and listed the “to” and “from” in the designs. The first ones always turn out really well but after that I get impatient. If any of you have ever received anything from me in the mail, you know my handwriting is a crapshoot: sometimes it’s neat and legible and fancy, and other times you’d think it was written by a doctor. Or a cat. 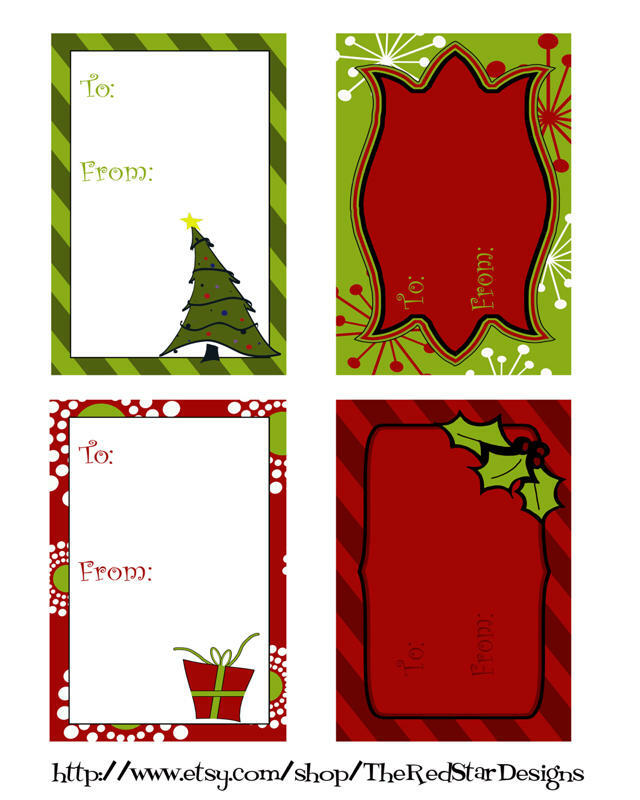 I really wanted to make my own cute, printable gift tags this year. I’ve seen them on etsy and I thought I could harness my photoshop abilities to come up with something pretty. I’d even offer it here because who wouldn’t appreciate a free printable in time for the holidays? Well, I’m embarrassed to admit, I failed. I mean, I accomplished making gift tags. I just utterly failed to make them cute. I am determined to have cute Christmas gift tags this year, so when I failed to make them myself, I asked my Angela of The Red Star Designs if she would help. She agreed to let me offer them here for readers at home who lack the time or patience to make them themselves. I did not even have to specify that I wanted cute gift tags because all her tags are cute. Click the photo below and you can save the jpeg version to print them out. My personal fave is the green one with the red and white snowflakes. Those are adorable, thanks, Andrea! Dude, we need pictures of these sharpies art pieces! That sounds really awesome. In the past, I wrapped my gifts in aluminum foil and then used really colorful awesome bows. They turned out well. Oooh, I’m taking note of this foil idea. I totally heart free printables. love these!! !amazing…will love to make them though,instead of printing!!! !cheers!